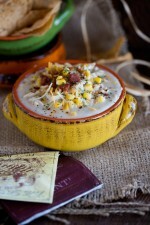 Delicious white bean chili with a bit of kick! Double this recipe, to feed a family of 5 or 6 people. Add chicken and broth to crockpot. Combine dry ingredients in a small mixing bowl and then sprinkle over the chicken. Allow chicken to cook for 4-6 hours on low, or until chicken is done and fork tender. When chicken is cooked and tender, shred with fork. Cook add’t 30 mins or until cheese is melted. Top with additional grated Cheese & bacon pieces. Serve with tortilla chips and guacamole. Whisk or shake 3 Tablespoons flour into 1/3 cup whipping cream or milk. Make sure that there are not any lumps in mixture. (I put this into a pint jar with a lid, and shake, shake, shake! Slowly, stir this mixture into the soup and continue cooking for the last 30 minutes.